I’ve been enjoying this spirit out in the occasional cocktail, and I’m excited to have finally bought a bottle to try on its own. I’m drinking it on the rocks, and it interestingly divides into rivulets on first contact with the ice. Honestly, that makes me scared to drink it! The moonshine has a unique smell, too, like bubble gum. It tastes like a hybrid of bubble gum and cotton candy, much sweeter than I expected and almost syrupy. Vanilla notes are in the mix along with some very, very light nutmeg. It’ll be too sweet for some palates, but it’s much more layered than I expected, which comes out more with every sip. Overall, a tad too sweet for my palate, too, but a lovely sipper and mixer, nonetheless. This has got to be Santa’s favorite moonshine! Seriously. If you nose and taste this and don’t pick up notes of egg nog here, something is wrong with your face! Aromas of nutmeg, cinnamon and sweet vanilla extract have been painted all up and down this grain neutral spirit. It’s hard to compare this stuff to other moonshine, because even though it bears the name, it is truly one-of-a-kind. This spirit has so much flavor, it can’t be described. The scents of cinnamon and nutmeg are very voluptuous in this spirit . . . There is little to no burn when enjoying this neutral spirit, and that is what makes it really enjoyable. This spirit would be great in a mixed drink, but I can’t see doing that in a valuable case. Considering the quality and intricacies of this spirit, I can’t see mixing it with anything. This spirit is incredible on ice and is best enjoyed alone. Great job, Piedmont. Kudos. Nose: Toffee and caramel cream candy. Taste: Cinnamon, cardamom, Chinese five spice, cigar box. Creamy mouthfeel and flavor. A lot of depth and complexity for a moonshine, wow! Nice blog, thanks for all the keen insights. 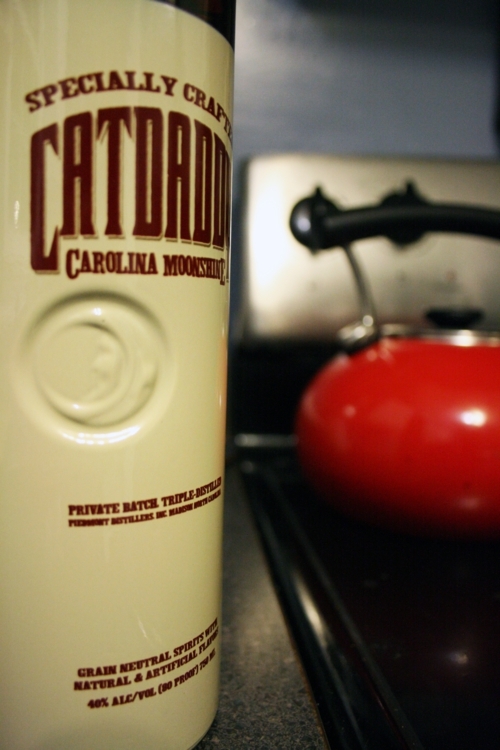 Thought you might be interested in this piece I produced for UNC-TV about Catdaddy and Piedmont Distillers. Thanks Dave! The video was great, and I had no idea that Junior Johnson was a partner, though I have tried the Midnight Moon once in a cocktail. I’ll be reviewing it soon in the future on its own. Those fruit-filled moonshines looked fantastic!